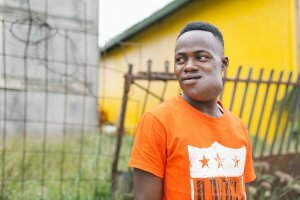 Samory never imagined that neglecting a toothache would result in a facial tumour that threatened his dreams and his life. Four years after his toothache began, the once healthy 25-year-old was a shell of who he once was. As his tumour grew and his self-esteem deflated. Having grown up in a rural village in Guinea, Samory knew there was a slim chance he would be able to seek medical attention due to the cost, availability, and his own financial restrictions. His mother tried using traditional remedies to help the growing lump but to no avail. Samory’s tumour wasn’t slowing down, and each day it was more painful than the last. But Samory didn’t always feel this way. Before he was forced to leave school due to the pain of his tumour, he looked forward to becoming a mathematics teacher one day; he was the only one in his family to attempt continuing his studies. But the people he thought were his friends cruelly declared that it was this ambition to better his life that in fact cursed his health. After the pain became too much to bear, Samory reluctantly made the journey to the capital city to seek help, even though he knew he could not afford it. 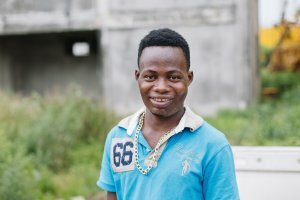 But when he reached Conakry, he heard the good news he so desperately needed— a ship that would perform free surgeries had arrived in his home country! 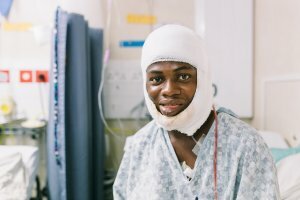 After being approved for surgery on the Africa Mercy to finally remove his painful tumour, Samory’s dreams for the future no longer seemed so distant.